There were three major pilgrimages in the Middle Ages: to Rome, to Jerusalem, and to Santiago de Compostela. The pilgrimage to Compostela was the most exotic. Rome was in the Bible and so was Jerusalem, and the medievals felt they knew something about both. But Compostela was mysterious. It had become a pilgrimage site only in the ninth century, when the body of St. James, the apostle who’d Christianized Spain, was discovered at the northern tip of Spain. It was said that the body had arrived in a stone boat that set sail from Jerusalem after the saint was martyred. A church was built for it, and monasteries were constructed across France and Northern Spain as stopping places for pilgrims. 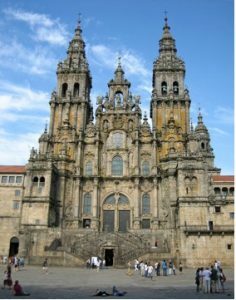 The pilgrimage to Compostela became very popular; by the twelfth century, hundreds of thousands of pilgrims were walking to Compostela every year. After the Middle Ages it fell into disuse, but was revived in the 1980s, with the rediscovery of its ancient paths and motivations.